The only problem with Rush is that they are just so good. 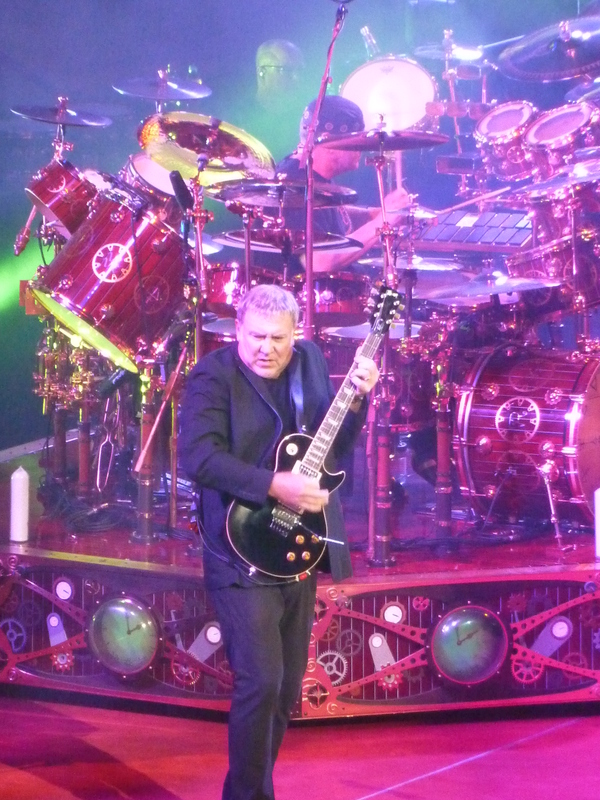 Canada’s best and brightest export began the West Coast leg of their Clockwork Angels tour on Tuesday in Seattle at KeyArena and to call the show fantastic would be an understatement. Geddy Lee (vocals, bass, keyboards), Alex Lifeson (guitars and yes piano) and Neil Peart (drums) power “tri-owed” their way through a nearly three-hour 26-song set featuring nine cuts from their latest album and the Clockwork Angels String Ensemble. The first-half of the set was a 10-song sprint highlighting much of the band’s classics from the 80s. 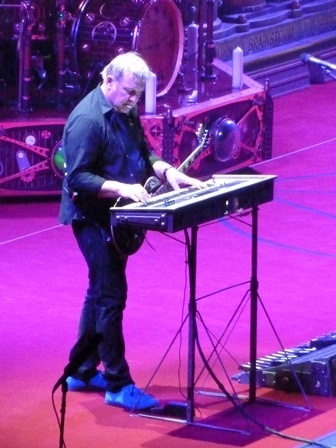 Despite what is often negatively perceived as the keyboard era of Rush, Lee did in fact spend more time behind keyboards then the last three tours combined. But what is seemingly lost on those who strayed from the band shortly after Signals was released in 1982 is just how sharp and natural those albums and songs are. “Subdivisions” started the night, followed by “The Big Money” and “Force Ten.” Lee said the band was celebrating the 30th anniversary of Signals but the evening clearly belonged to 1985’s Power Windows once Rush played deep tracks from that album including “Grand Designs,” “Middletown Dreams,” and “Territories.” “Analog Kid” was the other addition from Signals and Lifeson played a flawless and breathtaking solo. It was indeed a lesson in how to play rock guitar. 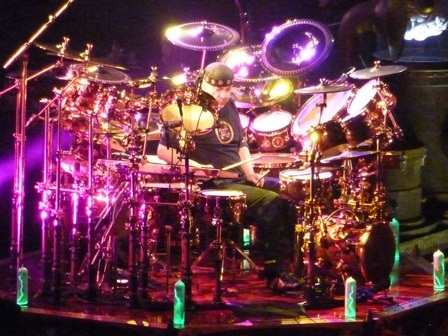 Peart incorporated the first of two solos in the middle of “Where’s My Thing” and the band closed with “Far Cry” before taking what is now a standard 10-minute break. “The Pass” a Rush classic was the only low-point of the evening. It was dropped near the end of a blistering set of a very fast-paced song list and it came across as slow and somewhat cumbersome. The emotional tone so evident on the Presto album never took hold. The evening was truly for the devoted as Rush began the second set with “Caravan” and didn’t stop playing songs from Clockwork Angels until eight more were done. Yes some energy was lost from the first half of the night as many in the crowd were no doubt there to simply see the band and hopefully get a line-up of their radio staples but Clockwork Angels, especially when you understand the album’s concept, is a creative masterpiece. Musically it is so different (yet with tastes from a number of their albums) it was almost like a different band was on stage. It was obvious Rush was changing things up a bit when an eight-piece string ensemble walked onto an elevated platform set up just behind Peart. Many of the songs on Clockwork have string arrangements so the incorporation of live instruments rather than triggers was an interesting inclusion. Initially it didn’t seem to work all that much with “Caravan,” which started the second set off and doesn’t have strings on the album version, however after the title track and deeper album cuts like “The Anarchist” and “Carnies” were played the ensemble really worked. And end any worries of them distracting from the show because once the band plays they are simply background. “The Wreckers” proved to be just as stirring as the album version and should be a staple in future tours. 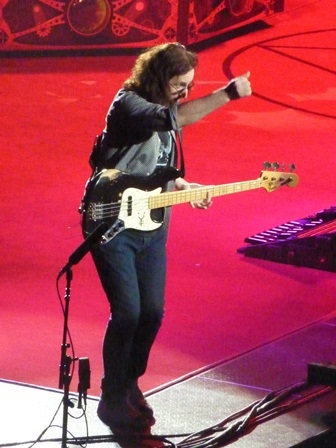 “Headlong Flight” was solid hard rock and infused some of that energy lost especially when Peart embarked on a short solo and then Lifeson added his own guitar work to open “Halo Effect.” Clockwork tracks came to end with “The Garden” a fan and band favorite featuring Lifeson playing the piano. All told the Clockwork package was strong and the evening could have ended shortly after those nine songs but the band just kept playing! Dreamline brought the crowd back to classic Rush then Peart embarked on his second solo. Gone is the usual eight-minute drum package, instead Peart worked two shorter (about three minute or so) solos into the set and it’s hardly a reflection of Peart slowing down a bit as a performer. Remember – 26 songs. Rush ended the night with Red Sector A, YYZ, Spirit of Radio and encored with of course Tom Sawyer and 2112 – Overture, The Temples of Syrinx and Grand Finale. It was without a doubt a rock show for the ages. Lee, Lifeson and Peart are such masters of their craft the band can be considered a super group. Lifeson was recently honored with the distinction of being the best all-time guitarist in Canadian history but the man gets absolutely little love in the United States. Considering the state of the music business here it’s not surprising or really even an insult. Lee’s voice was flawless and sharp and his bass playing is already in annals of rock history. Peart? He just continues to improve and even band naysayers have to admit he’s the best at his art. Thank God there is a band like Rush that continues to stretch itself musically and artistically. All three members undeniably love playing, love making music and care about their fans. Peart is 60 and Lee and Lifeson are less than a year away from that milestone and they continue to tread new ground and outplay bands half their age.